New Zealand U18 came through undefeated at the recent tournament in New Caledonia with strong showing in all games. Congratulations to the team and officials. The team also took out the fairplay award. 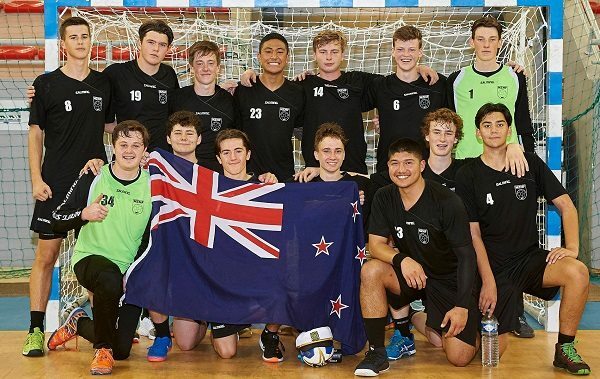 Coach, Tim Rayner, said, "Particular highlight for me was to see a very professional young group from throughout New Zealand come together with one common goal of taking out the tournament. Handball is a young sport in New Zealand, so it is great that New Zealand is able to compete with countries such as the host nation New Caledonia where they grow up playing Handball in schools and where their technical abilities are so evident. It really does prove to me that with the success New Zealand Handball is having, New Zealand will be able to push through to new levels of handball in the future. Tournaments such as this are so critical for the development of Handball in our region." Danyah-Lee advised, "The tournament was a great success in my eyes, being on centre court, under the lights and music much like you would see on TV with a loud crowd really made the experience feel like we were playing at high level. In particular the game against New Caledonia, which we always expected to be one of our toughest challenges, with the strong home crowd support for their boys, really made me realise how big handball is around the world and how big a stage we were on. I'm really looking forward to the next stage and I know the boys are pumped to reach new levels." NZ's U20 team came a creditable 4th, with this section won by Australia.